My edition: paperback (proof), to be published on 5 June 2014 by Abacus, 314 pages. Description: Prudencia Prim is a young woman of high ideals, intelligence and achievement, with an extensive knowledge of literature and several letters after her name. But when she accepts the post of private librarian to a wealthy bibliophile in the secluded village of San Ireneo de Arnois, she is unprepared for what she will encounter there. Her employer, a philosopher and intellectual, is dashing yet contrarian, always ready with a stinging critique of her beloved Austen and Alcott. And the neighbours are also capable of charm and eccentricity in equal measure, determined as they are to preserve their singular little community from the outside world. Thoughtful, gentle Prudencia might have hoped for friendship in San Ireneo but she didn't expect to find romance - nor did she expect the course of her new life to run quite so rocky, to offer challenge and heartache as well as discovery, joy and delicious regional pastries. Every once in a while you read a book that is written so beautifully that not only do you get lost in the story, but you do so in the carefully crafted words as well. 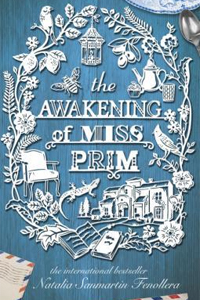 The Awakening of Miss Prim is one such a novel. As soon as I turned the first page I tumbled into an almost poetical world, filled with lush descriptions and rhythmical sentences, which had me in awe of the author's exceptional eloquence. The story within the book felt really special as well, not in the least because of main character Miss Prim's love for the written word, which of course strongly appealed to a book lover such as myself. The whole novel was doused in a contagious appreciation for literature, philosophy and education, which made this a truly extraordinary and thoughtful piece of writing. Prudencia Prim is a highly intelligent woman. When she comes across a vacancy advertising for someone to re-organise a private library it doesn't sound terribly challenging, but as a proper bibliophile and in need of work Miss Prim's interest is instantly piqued. If the comment at the bottom of the vacancy, "graduates and post graduates need not apply", wasn't sufficient for her to discover that there is something different about her potential employer, then her meeting with The Man in the Wingchair certainly seals the deal. Furthermore, the entire village of San Ireneo de Arnois seems just slightly peculiar. Miss Prim soon discovers that the place is an idyllic utopia of sorts for people who want to steer away from the hustle and bustle of the 21st century. They've taken it upon themselves to create a self-sufficient community, which not only means that they produce virtually everything they need on a day-to-day basis within the village, but also that they teach the children within the community themselves. From a very young age these kids become acquainted not only with the literary greats, but also with philosophical conundrums that may seem beyond the youngsters' intellectual grasp but actually motivate these still impressionable minds in exceptional ways. I relished author Natalia Sanmartin Fenollera's inventive way with words and it made me wish that more books would not only focus on the plot and characters, but also on conveying the message on the pages in such a unique and charming matter. As I was reading this novel I almost felt myself getting more intelligent just by absorbing the words. Though my IQ probably didn't actually notch up a few points, it was certainly refreshing to come across such an intellectually stimulating read. The Awakening of Miss Prim is laced with beautiful poetical language and thoughtful discussions, enriching the reader's mind along the way. Visually striking, carefully crafted and exceptionally elegant, it is a stunner of a novel in every single way. You can pre-order a copy of the novel from Waterstones, Amazon.co.uk, Amazon.com or your own preferred retailer. Many thanks to the publisher for providing an advance copy of the novel in exchange for an honest review.